Being able to control your hot tub is very important so that everything works the way you want it to. Ensuring you have the ideal temperature settings and are running efficiently but also conserving energy when possible will make your hot tub experience as enjoyable as possible. Your Top Side Control System is responsible for all of these functions; it communicates your choices to the “brain” or your spa control pack. Depending on what type of spa you have and what options you need to control, there are many different top side panels available. Before purchasing a new top side panel you will want to ensure that it is compatible with your existing spa control pack. Often times you can get a part number off of your existing top side panel simply by pulling it up out of its housing in the spa. There is usually a sticker on the side indicating a part number from the manufacturer, otherwise get the part number for your spa control pack and a simple call to the manufacturer and you can figure out which top side control panel will work for you. This button will control water flow through your jets; some larger tubs can have up to three jet buttons that control different sections of jets within the spa. Many also have different speeds that the pump can send water through the jets at. Meaning pushing the button one time will start the jets on a low speed and pushing it a second time will take it to a higher water pressure. This function would also depend on whether the hot tub is running with a 1 or 2 speed pump. The “blower” button will control the hot tub’s air blower or bubbler as it is sometimes referred to. The blower introduces air into the water through a series of air injectors. Blowers cause the bubbling effect in the water adding to the ambiance of the spa experience and when used along with the jets creates an even more relaxing experience. Depending on what type of spa you have and the lighting options in it, this button can help you to set the mood. The light button is used to control all the light function in the spa, many change colors from red to blue to green, some even have purple and orange. If your hot tub is equipped with a light show function this would also control the different settings within the light show function. With one button controlling all of these options you will have to click through the options one by one to find the one perfect for you and your desired setting. 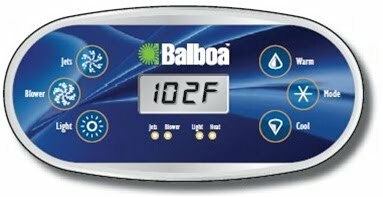 Most spas that have a temperature control included in the top side panel will have two buttons, a temp up button and a temp down button. Having these controls right at your fingertips makes getting the ideal temperature setting in your spa as easy as the push of a button! This also makes it very easy to turn your spa down a few degrees when it is not being used and then turn it up a few hours before it is going to be used, this will help to conserve a little bit of energy! If your spa has these function buttons you will want to consult your owner’s manual for instructions specific to your spa. These large easy to read displays can tell you things like where you temperature is set or if there may be a problem with some for your equipment based on an error reading that may display on the screen. Having these gives you a reliable communication interface to what is going on inside your hot tub. Messages can appear on you top side control panel when your spa pack needs to tell you something. Depending on your spa and the control panel you have some of these messages may be telling you it is time for a new filter, other maintenance, or that you may have a potential problem with some of your equipment. Please see your owner’s manual for a complete list of possible panel messages but here are some examples of common ones that may appear. GFI or GFCI FAILURE: This is telling you that your hot tub could not trip the GFCI breaker and continued operation may be unsafe, probably time to call your spa technician. HH or HTR TEMP LMT or OH or OHS or OHH: Any of these messages are telling you the spa has over heated and DO NOT enter the water as it could be at a dangerous temperature. Open the cover and allow the water to cool down, once the water has cooled you should be able to reset by pushing any button. You should also test your sensors and make sure everything is working properly. Some top side systems also provide settings such as Winter Mode and Summer Mode; these allow you to set the different functions on your spa to run at certain times of day in certain seasons. This can help conserve energy and save money on utility bills. Again in this article, we have gone over many options for topside control systems, some which may apply to you spa and some that may not. For specific details on your spa and top side control system please consult your owner’s manual.